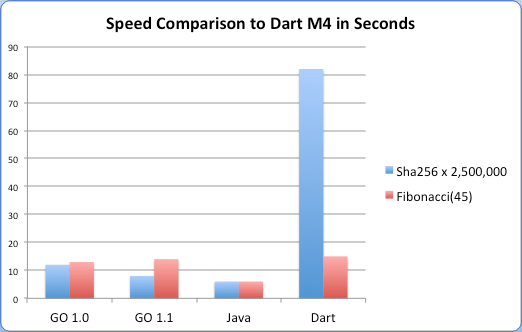 Dart tools are pretty good. 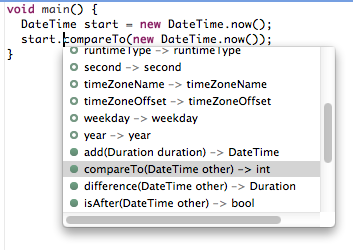 The Eclipse plugin had an issue, but the standalone Dart IDE worked great. I had no issues with the stand alone version's logging, warnings, errors, running, or auto-completion. Fourth party support is needed for database drivers. By this I mean that DB vendors don't have Dart drivers and there is a small amount of support for third party support for the third party vendor drivers. Observe the absence of a constructor body, yet x gets set. A great return from C++. Dart annotations are easy to declare. They're just classes that usually start with lower case characters. Libraries: The code part of a package that uses library and part keywords to modularize code for a package. Packages: A package is a config + Library. The config lets you to define dependencies of a package using a Pubspec file (yaml). Futures allow you to run callback after a Timer or thread(Isolate) has completed or erred out. Isolates(Threads that are isolated from each other) are just functions passed to spawnFunction(). They can talk to other threads using send(), receive(), and call().